People are growing more and more conscientious of the impact vehicles have on the environment. Because of this awareness, hybrid, fuel cell, and electric vehicles are becoming increasingly popular. Among these vehicles is the 2018 Honda Accord Hybrid, a hybrid option for Honda’s popular Accord sedan. Now, this vehicle is also available in Dayton, OH. There are 4 trim levels for the Honda Accord that offer hybrid engines: Lx, EX, EX-L, and Touring. Each of these options have a horsepower of 212 and a torque of 232 ft-lbs. The transmission is an Electronic Continuously Variable Transmission that has Sport Mode and Deceleration Selectors. This hybrid vehicle gets an EPA-estimate fuel economy* of 47 miles per gallon in the city, highway, and combined, and has a fuel tank capacity of 12.8 gallons. The hybrid vehicle also has active shutter grill, along with Smart entry with Walk Away Auto Lock® as well. 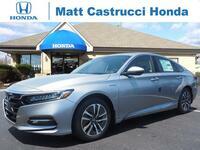 The Honda brand’s Accord Hybrid offers the same safety features as you might expect for any other sedan. This means that it has plenty of driver-assistive technology, including the LKAs, or Lane Keeping Assist System, Adaptive Cruise Control, and Traffic Sign Recognition that are all a part of the Honda Sensing® package. Features that aren’t part of the Honda Sensing® package includes things like the Blind Spot Information System with Cross Traffic Monitor (offered on all the hybrid trims except the LX), as well as the Auto High-Beam Headlights. Those looking for comfort and convenience features should be pleased to know that the Hybrid is not lacking. From simple things like a push button start and tilt and telescopic steering column to a capless fuel filter, the Accord Hybrid is fit for you to drive in comfort and style. Other technology features include a 7-inch touchscreen for the LX trim, while the Ex, EX-L, and Touring offer an 8-inch touchscreen display. All trims offer Bluetooth Streaming Audio and HandsFreeLink, as well as Pandora Compatibility. Interested in the 2018 Honda Accord Hybrid? 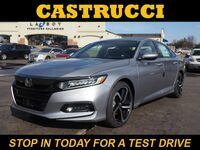 Swing by Matt Castrucci Honda for a test drive, or feel free to call us with any questions you may have! *47 city/47 highway/47 combined mpg rating for Hybrid models with E-CVT. Based on 2018 EPA mileage ratings. Use for comparison purposes only. Based on 2018 EPA mileage ratings. Use for comparison purposes only. Your mileage will vary depending on driving conditions, how you drive and maintain your vehicle, battery-package/condition, and other factors. 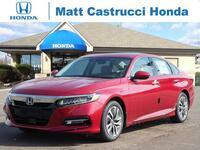 Interested in a Honda Accord Hybrid?